Thomas Merton’s conversion to Catholicism is detailed in his famous autobiography, The Seven Story Mountain. He eventually became a Trappist monk. 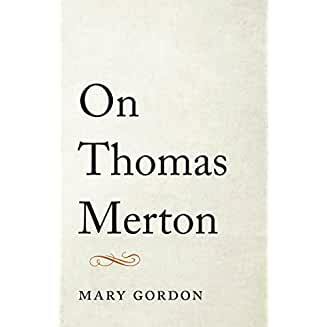 This book by Mary Gordon focuses on Merton as a writer, and will mainly be of interest to other writers (and English major types, like me). If you haven’t yet read much by or about or Merton, don’t start with this one. You will get bits of her personal life, but not in a linear way. In this short book, Gordon discusses at length a novel entitled My Argument with the Gestapo, written by Merton in 1941 and unpublished until a year after his death. She also includes some of his correspondence with other writers, including Evelyn Waugh and Czeslaw Milosz (a Polish poet). If you’re not interested in writing, you’ll bog down in these literary discussions. You’ll also learn, if you didn’t know, that Merton wrote poetry at times. Gordon saw Merton’s journals as his greatest accomplishment. They contained his greatest writing and were the form to which he was best suited. She describes him as “ardent, heartfelt and headlong.” His passionate relationship with God is what comes through consistently. My verdict? Two stars. This book won’t have a wide appeal. This song from the 1970’s was written by Lanny Wolfe, an American Christian music songwriter, musician, music publisher, and music teacher. The song came to Wolfe while he was waiting for a church dedication. He immediately wrote down the words and melody, taught it to his trio and played it on the spot. It’s often used on our Lutheran Via de Cristo weekends, and I used it recently as part of a closing devotion with our Fanning the Flame team. It’s a good reminder that God is with us everywhere. This was written by one of our Fanning the Flame team members, Debbie. It is about her experience in learning more about spiritual gifts. One of the many positive things coming out of Fanning the Flame is that we are finding out what our spiritual gifts are. Some of us already know what our gift is but we might not really understand what it means and are not quite sure how we can use it to the glory of God. God has given us all spiritual gifts through the Holy Spirit. We may find out we have more than one but one or two are the strongest. One thing I have learned is that there are spiritual gifts that I don’t have that someone else may have but that is okay. I need to use the gifts God has given me because as a congregation we need to use the gifts that are given to each of us. When you put all of our gifts together we have everything covered to do God’s work. That is the Holy Spirit’s plan. A Church that as a congregation does not use their gifts is impotent. The definition of the word impotent as used in the Bible is “to be without strength”. That means the Church that does not use their gifts will not be a healthy Church. Even though we may know what our gifts are and would like to use them as God has intended we might not know what to do. I know for me that the Small Groups Discipleship Ministry that we are starting is going to help me use my gifts working with others in the group. In a small group you get a chance to really get to know each other and learn to work together to achieve what we are intended to do. I personally don’t think I would be able to do enough on my own but in a small group I feel the possibilities are endless. Anyone who has not done a spiritual gift assessment I urge you do that. It is very interesting and exciting to do. Also Joan is sharing her knowledge of spiritual gifts with us in the Sunday School class. We are looking at each spiritual gift and what them mean, where they are described in the Bible and there is discussion of examples of each and how they apply in our daily lives. 1 Corinthians 12:6-7 6 and there are varieties of activities, but it is the same God who empowers them all in everyone. 7 To each is given the manifestation of the Spirit for the common good. To take the first steps, a leader must have a mission/vision. He or she does the basics well, and understands the need for a personal coach. Great leaders lead with hope. And this is very important: Effective leaders do NOT develop leadership teams, they develop teams of leaders. They generate leadership factories. Maintaining energy through the team leader, believing in the mission/vision, team dynamic and relationships and overcoming obstacles. The “Leaders In Action” book series was recommended as a resource. Note to the ladies: I checked this series out and have requested a few to read and review; however, disappointingly there is only one woman included in the set. 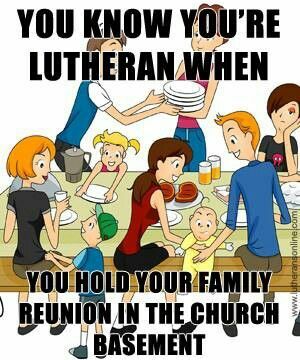 I Guess We’re REALLY Lutherans! I had to post this when I saw it because our family actually does this …. Is it really because we’re Lutherans? I checked this book out of the local library after I did a spiritual gift assessment with a young man at our church. He is in college, and it turns out that he is very interested in philosophy and “deep thinking.” I told him he might enjoy reading some Christian apologists. No, this doesn’t mean people who apologize for being Christian; apologetics is the branch of theology that deals with explaining and defending the faith. I know some of the writings of C.S. Lewis fall into this category, as well as books by Lee Strobel (The Case For Christ). 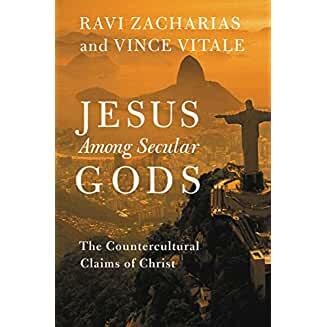 I asked my husband for some other suggestions, and he mentioned Ravi Zacharias, which led me to Jesus Among Secular Gods. Dr. Zacharias is an Indian-born Christian who is well known as an author and has received numerous honorary doctorates in recognition of the impact of his work. This book was co-authored with Dr. Vince Vitale, Director of the Zacharias Institute, who has been a Professor of Philosophy of Religion at both Yale and Oxford. The book did not disappoint; I think my young friend would like it, as would most Christians seeking to better understand secular philosophies and how to counter their attacks on Christianity. Each chapter is written by one of the authors and presents various modern day approaches to the big questions of life — how we came to exist and why we are here. One major point Zacharias and Vitale make is that we are losing our ability to disagree in love. Disagreeing should not lead to disrespect and demonizing. People today have become afraid to disagree, because they see it as a personal attack. Only through open questioning and debate can people arrive at the truth and love one another despite differences. The conclusion of the authors is that each secular philosophy contains a partial truth. Below is a direct quote. “Scientism: The partial truth is that science explains a lot. But we forget that it cannot explain itself, and it cannot explain many of the most important things in life. Relativism: The partial truth is that refusing to see things from another’s perspective is dangerous and lacks love. But we forget that this relies on there being an objective perspective according to which those different from us are valuable and worthy of respect. Pantheism: The partial truth is the divine is everywhere and that union with the divine is our destiny. But that union is not the union of sameness, but the union of relationship. Pluralism: The partial truth is that no worldview has a monopoly on truth. But we mistake this for all worldviews being equally true. Humanism: Human persons were indeed made for greatness. But greatness results from divine grace and strength, not human self-reliance. Any Christian who reads this book will finish better prepared to explain why Christianity is the best answer to the questions of existence. The material is clear and not too technical or academic for most to understand. VERDICT: I recommend this book and give it five stars! Sheep are timid and easily frightened into stampeding by the smallest of animals (for example a jackrabbit jumping into their midst); they are also disturbed by infighting among the flock — nothing quiets down these anxieties and tensions down as much as the presence of the shepherd among them. It is not unusual for a sheep to accidentally become turned over on its’ back and be unable to get up by itself. The old English term for this is “cast” or “cast down.” A “cast” sheep is helpless and dependent upon the shepherd to find and restore it. When sheep are left to themselves they will destroy their grazing fields. They stay in the same location, follow the same paths, overgraze and pollute the area until it is ruined. They require the attention of a good shepherd to move the sheep continually so that they and they and the land are preserved. Sheep are troubled by flies, gnats and other parasites during the summer months. To alleviate their discomfort, the shepherd will apply a remedy including linseed oil to their heads–he anoints them. VERDICT: 5 stars. 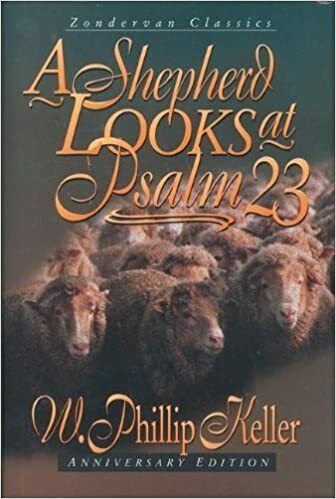 I think most Christians will enjoy this book and develop a deeper insight into a Psalm we repeat so often that we seldom stop to meditate on the deeper meaning.